CeCe Olisa and Chastity Garner Valentine are two of our 2018 TODAY Style Heroes. Click here to see the full list! 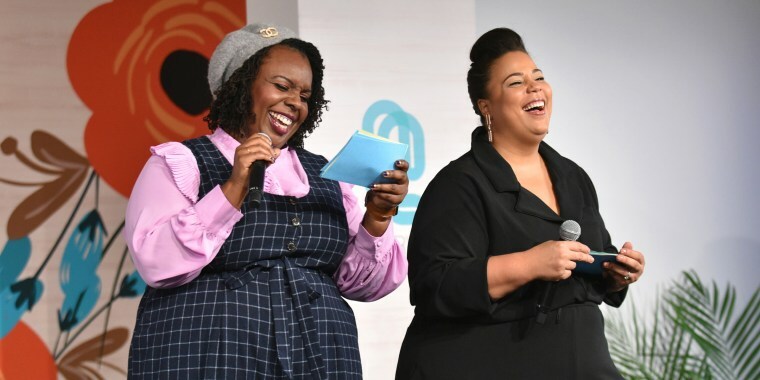 CeCe Olisa and Chastity Garner Valentine are friends, bloggers and co-founders of theCURVYCon, a three-day convention celebrating the plus-size community. Now in it's fourth year, the event (from Thursday, Sept. 6 to Saturday, Sept. 8 in New York City) features celebrity appearances — including award-winning actor and author Gabourey Sidibe as the keynote speaker — runway shows, pop-up shops, panels and workshops to dig deeper into topics like fashion inclusivity and self-love. While Olisa and Garner Valentine have seen the fashion industry make great strides in the last four years, they also admit to TODAY Style that more progress needs to be made. For one thing: offering curvy women better options in brick-and-mortar stores. The other day, I was traveling and needed a last-minute outfit for the evening. I walked into six different stores and couldn’t find anything that was both my size and my style. Six. Different. Stores. The things I would even consider wearing only went up to a size 10 and the things that actually fit me were more appropriate for a woman twice my age. Finally, I found one store that carried on-trend, plus-size clothing for a woman my age. I immediately shared a video of that shopping experience on my YouTube channel and called my bestie and business partner, Chastity, to talk about it. If you've never been over a size 14, then you probably won’t know the frustration of needing something to wear at the last minute and not being able to find a store that 1) has your size 2) has something that doesn't cater your grandmother's generation and 3) is within driving distance. If you are under a size 14, a quick trip to the mall will quickly serve your needs because they have options that cater to a wide variety of styles, ages and clothing genres. But over a size 14? Forget it. We've both been over a size 14 for most of our lives. Our teenage years consisted of shopping the men's section and the older women's sections to find something that fits. Fast forward to the internet shopping revolution, there are now a lot more options, but still very few opportunities to buy in person. We are fortunate that as bloggers, we're familiar with a lot of the brands and how they fit. For the average plus-size shopper, she is stuck between limited plus-size options in stores and the apprehension of shopping blind online. It was a daunting experience when I first started shopping online. I was a college student on a budget and every store had different sizing. I had to order two of the same item in different sizes just to get the right fit, then I’d keep the item that fit and send back the other (and it wasn’t always free return shipping). Online shopping has been a mecca for the fashionable plus-size girl who knows her body. I emphasize "knows her body." To online shop, you have to know your body, know the brand and know the fabric to best guess your size. If not, you could get stuck in a loop of returning that is both time-consuming and expensive. "Imagine walking past a very chic misses section then walking to the plus-size section with a fraction of the fashionable offerings and none of the appeal. This is the plight of the plus-size shopper." Even if brick-and-mortar stores carry our sizes, the experience is off-putting to say the least. Our options are located in the basement or by the children's section. There is usually a search party to even find the plus-size clothing section in the first place, and it is often poorly maintained and styled. Imagine walking past a very chic misses section then walking to the plus-size section with a fraction of the fashionable offerings and none of the appeal. This is the plight of the plus-size shopper. This article would also not be complete without taking a look into the decline of brick-and-mortar stores altogether. With many clothing chains closing, it’s interesting that there hasn’t been more of an effort to serve the plus-size consumer. One might ask, “Has there been any improvement?” There have been slight improvements with the opening of a few new chains here and there, but the change has been minimal. The plus-size consumer is the future and could potentially be the bread and butter of the retail industry. I wish stores realized that catering to her is key. Even though plus-size fashion options online are growing quickly, it can be such a frustrating process that many women don’t take full advantage of the online-shopping experience. I want the option of walking into a store and trying things on … I still want that option! That’s why we co-founded theCURVYcon. One of our unique experiences is theCURVYcon pop-up shop, where we curate a dream mall for curvy women. We ask the best plus-size fashion brands and independent designers, many of whom are primarily online, to be a part of our pop-up shop, to bring full-size runs of their products and let women try on clothes before they buy (yes, we provide dressing rooms, too!). This experience is a one-of-a-kind opportunity for women who wear a size 14 or higher. Women fly in from around the world to be a part of that experience. While we love serving the plus-size community in this way, we don’t want theCURVYcon to be the only opportunity for curvy woman to have an in-person shopping experience. Brick-and-mortar stores, it's time to step it up. You can visit theCURVYcon pop up shop for as little as $49, tickets available at theCURVYcon.com/tickets.